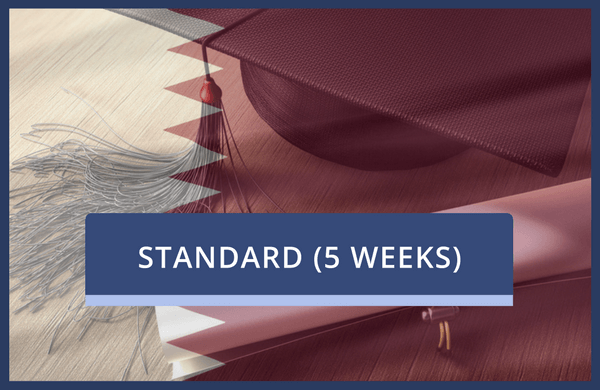 Choose this service to have a degree certificate attested for Qatar which requires certification beforehand by a solicitor or notary public. This is our standard 5-week service. All 3 items mentioned above have to be attested by the UK's Foreign & Common Wealth Office (FCO) prior to submitting it for legalisation at the Embassy of State of Qatar - London. The prices stated above are for the legalisation of three documents by both the FCO and the Embassy. Any certificate obtained via distance learning (Online) will NOT be accepted for legalisation. For any certificate, where the place of study and examination are outside the UK will NOT be accepted for legalisation. Also, please be aware that Qatar no longer accept online qualifications other than those issued by the Open University. If you have a degree certificate that was issued by the OU, you MUST state explicitly which university you studied at to attain the degree.